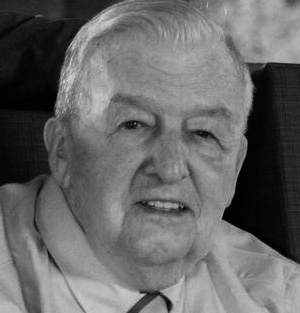 Raleigh Duke Ellis, Jr. 90, left Countryside Village in Stokesdale and entered his heavenly home on Thursday, March 28, 2019 after complications from pneumonia. A memorial service will be held on Sunday, April 7, 3:00 pm at Christ United Methodist Church, 410 N. Holden Road in Greensboro. A reception will follow the service. Raleigh was born in Suffolk, VA on November 12, 1928 where he grew up and excelled in sports, especially football. He attended Elon University on a football scholarship where he became co-captain. He majored in Business Administration and graduated in 1952. Raleigh joined the Marine Corp, served for two years, achieving the rank of 2nd Lieutenant and fought for our freedom in the Korean War. At the end of his military service, he married the former Carolyn Abel and had their first son, Raleigh Duke Ellis III (Duke) at Camp Lejeune. After his discharge, Raleigh went to work for Burlington Industries and worked in several NC cities until BI built their corporate headquarters in Greensboro. Raleigh and Carolyn, now with three more children (Steve, Melinda and Lori) moved to Greensboro for good in 1967. Raleigh worked tirelessly there as an executive accountant until his retirement. In Greensboro, Raleigh continued his life-long community service with The Lions Club, receiving numerous district and national honors. He and Carolyn joined Christ United Methodist Church during its early years and were a strategic part of its growth. Raleigh served with The Stephens Ministry there and volunteered in many other areas. Raleigh was preceded in death by his brother, Joe, and his sisters, Elizabeth and Frances. He is survived by his wife, Carolyn, his sons, Steve Ellis and Duke Ellis, his daughters, Melinda Moser and Lori Buck. He also had 10 grandchildren and 7 great-grandchildren. In lieu of flowers, the family would like donations, in Raleigh’s name, made to Christ United Methodist Church.